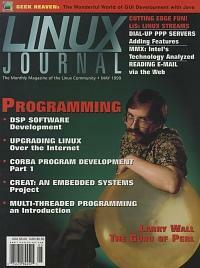 What's happening with the Perl scripting language—a bit of history and a look at the future. The authors provide some basics to get the new CORBA programmer started. Mr. Darwin takes a look at Java and describes the steps for writing a user interface in Java. Follow the development of speech algorithms for digital radios through the complete project life cycle. A description of thread programming basics for C programmers. An introduction to MMX and how to take advantage of its capabilities in your program. A look at the new Qt public license and the effects it may have on software development for KDE and GNOME. CREAT is a tool set for teaching embedded systems. In designing it, Mr. Bailey wanted it to be useful for real problems, cheap enough to build on the pittance which is an undergraduate's project budget, and totally open and accessible to the curious. Upgrading Linux Over the Internet A real life experience in remote upgrading of a Linux PC across the Pacific Ocean. Adding Features to Dial-Up PPP Service Mr. Haisley provides some PPP customization scripts for web hosting services. A Toolbox for the X User An introduction to several small graphical tools for the daily work of system administration. Reading E-mail Via the Web How to write your own program to read and send mail to any server on the Internet. The dialog command enables the use of window boxes in shell scripts to make their use more interactive. Mr. Anastacio demonstrates how to write an aplication starter in a standard format. Mr. Dinsel tells us how his former college is using Linux as a web server and teaching tool. Mr. Harari disects the buffer-overflow hack, thereby giving us the necessary information to avoid this problem. A look at three programs designed to help the C programmer find the cause of segmentation fault errors.